I got my copy this morning in the mail, I must say some nice reading & nice visuals! Lets see what's inside: The history of Reebok Pump, 23 page layout. DJ Senatore of New Jersey has 160 pairs of pumps. 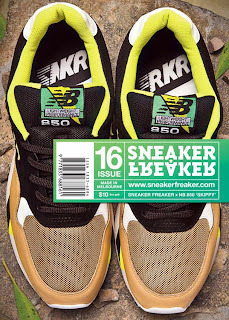 Also in this edition is Sneaker Freaker's colab with New Balance: SNEAKER FREAKER PRESENTS SKIPPY NEW BALANCE 850. This issue is a must have, EVERY issue is a must have! !